You can copy and paste elements and objects from other apps on your iPhone to Pages, for example a chart you create in Numbers, or you can create the chart directly in Pages. The charts, tables, shapes, and text styles are in keeping with the style of the template you are working in, although you can edit them as just explained for text and images. Tap the Add Element button (the plus sign). Media inserts photos, movies, and audio from the Photos and Music apps. Tap the type of media you want to insert and then scroll through the apps’ libraries to find the piece you want. Drag the resizing handles to shrink or enlarge the inserted element. Tap Edit Data in the pop-up menu of a chart. 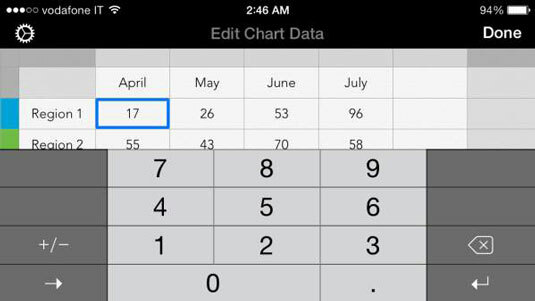 Tap in the fields to type in the data you want displayed in the chart, and then tap Done. Double-tap a field in a table and type in the information you want. Tap the element on the sheet, and then tap the Format button (the paintbrush). Tap the tabs to see the options for changing the appearance or modifying the typeface family, size, and color of any text. Again, choices will be in keeping with the template theme. Tables have the same Table, Header, and Arrange options that they do in Numbers. 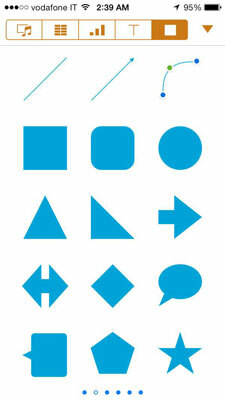 Charts give you options for labeling the X and Y Axes and stylizing the gridlines an tick marks. Use the Arrange feature of the Formatting tabs to properly layer overlapping elements such as a text box on a shape.